With the MHA rezone for the University District now behind them, the City Council has turned its attention to the next candidate in line: the Downtown/SLU area. The first discussion in the Planning, Land Use and Zoning Committee was a brief one, geared more towards summarizing the word the city has done to-date on the proposal and laying out the plan for the weeks to come. 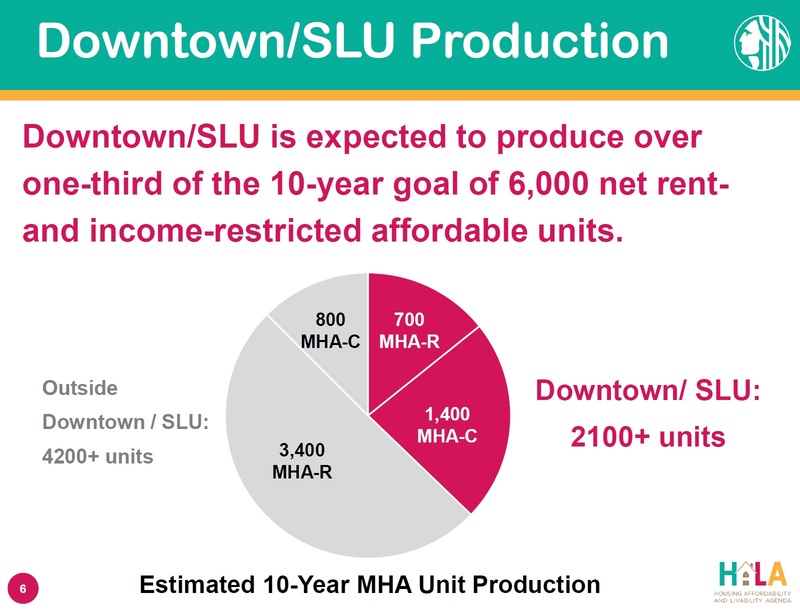 The stakes are high for this part of the MHA rezone: downtown and SLU are expected to produce at least 2100 units of affordable housing, over a third of the total generated by the MHA program. 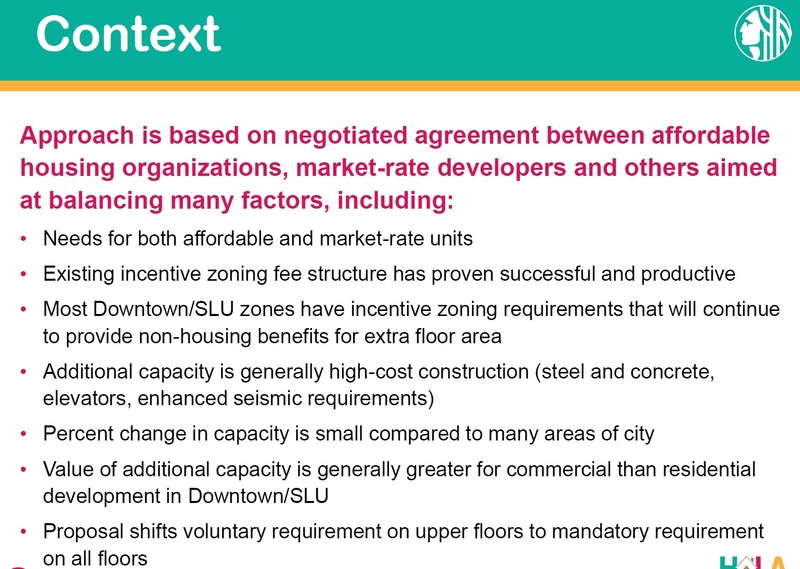 The basic concept is the same as for the University District: zoning restrictions are relaxed, in exchange for a requirement to either set aside affordable housing or pay into a fund so the city can create and/or preserve affordable housing. By law, the city can’t just require developers to produce affordable housing; it must give something in return. But the details in this area will differ somewhat from the U District, because the context is different. 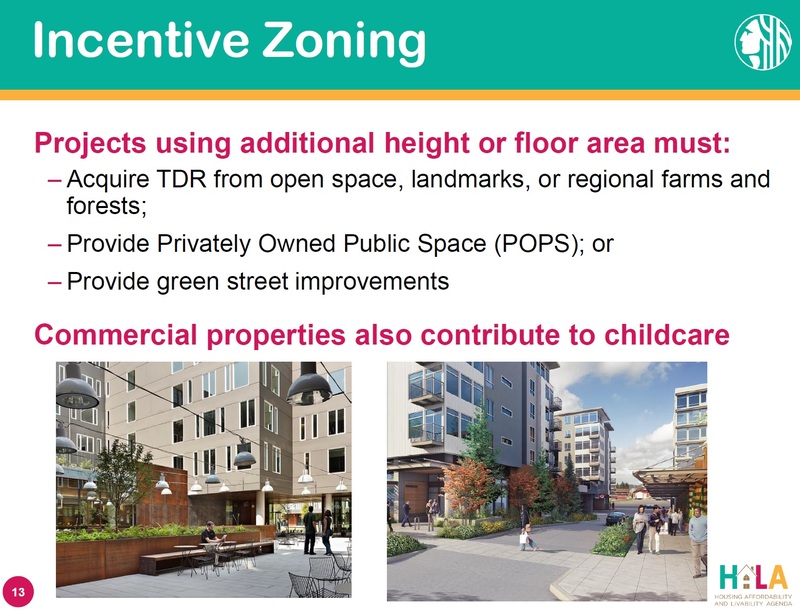 It’s already zoned for density (with a few exceptions), and there is already an Incentive Zoning program in place that raises zoning limits in exchange for a small amount of affordable housing (based on the additional development capacity granted, not the whole building) and some other public benefits. The MHA program would layer on top of this: developers would need to satisfy both the MHA and IZ programs. 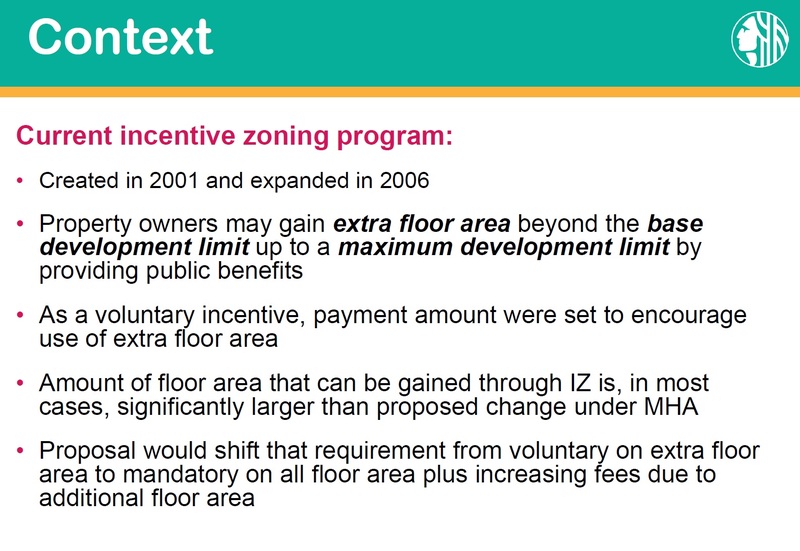 Because it’s largely a highrise zone, the zoning grants from the MHA program look a little different. 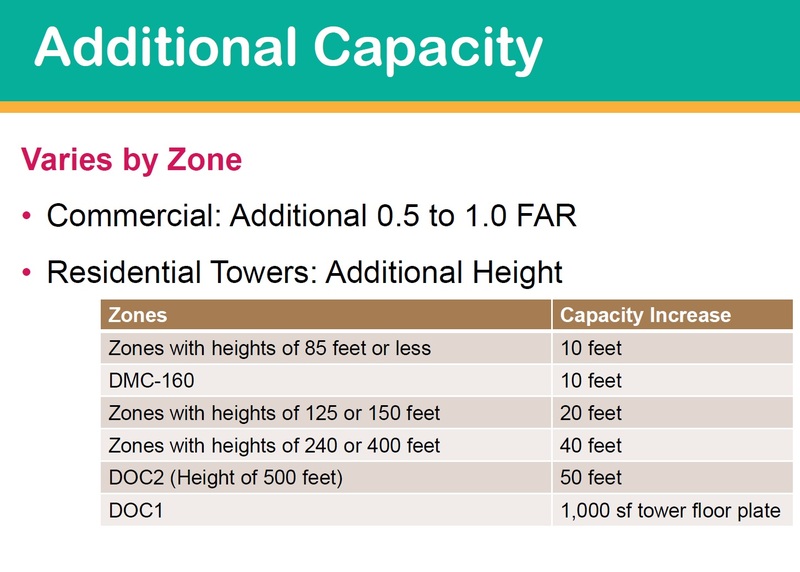 Currently buildings in commercial zones downtown are not constrained by height limits, but by limits on total floor area, so MHA would increase the floor area allowed. In residential zones, most buildings would get additional height; but there is one type of downtown residential zone that currently has no height limit and buildings in that zone would get an additional 1000 square feet instead. Highrise construction is expensive, and that limits the MHA requirements for set-asides/payments that can be required without making development infeasible. However, it’s also high volume, so even a relatively low set-aside percentage (or payment $/square foot) can generate a large amount of affordable housing units. The city has already done fairly extensive outreach to the community to understand its interests and concerns. Residents expressed a preference for taller and thinner buildings, in order to preserve views and open spaces and to maximize the amount of sunlight making it all the way to the ground. the South Lake Union waterfront, in order to maintain views. Also, the Chinatown/International District area will be handled separately. Council member Herbold wants to look at ways to incentivize family-sized housing units in the area. 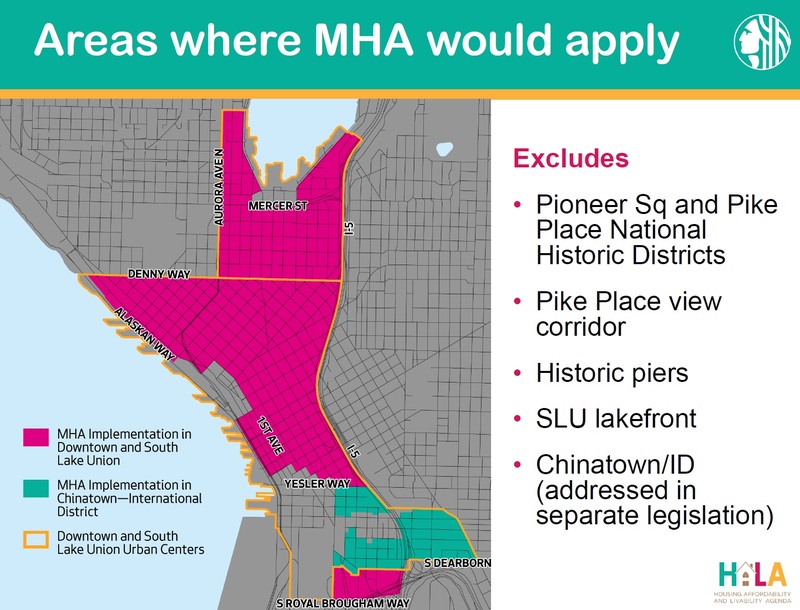 Council member Johnson, the PLUZ committee chair, wants to deliver an MHA package that will be attractive enough that some of the projects that are already permitted will want to opt in; he notes that not doing so would be a missed opportunity to generate a lot more affordable housing. Herbold also wants to make sure that much of the MHA payments (in lieu of performance) are invested back in the community that generated them, rather than in other parts of the city. According to the city’s analysis, few projects are expected to take the “performance” option, so the payments could generate as much as $190 million for the city to invest. Bagshaw echoed the concerns of some of her downtown constituents (especially those living in the Escala building) that maintaining views and separation between highrise buildings is important. 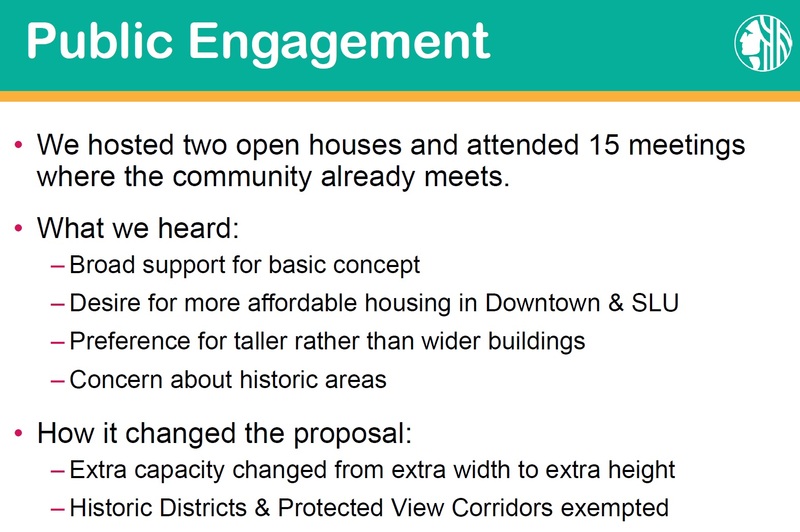 Bagshaw also stressed the importance of “livability” including green spaces, open spaces, and natural light. An ongoing issue is that there are no public schools downtown, despite the fact that large amounts of residential units are being built there. Neither the IZ nor the MHA programs will generate funds that could be used to create one. That’s led to a recurring demand for “impact fees” assessed on developers that could pay for schools and other important infrastructure. Johnson will continue the conversation at the next PLUZ committee meeting on March 7th, finishing the overview and beginning discussion of possible amendments. There will be a public hearing on the evening March 13th, and another PLUZ committee meeting on the 21st at which point Johnson hopes they are deliberating amendments. He hopes to wrap it up in 3 to 4 meetings, then move on to the Chinatown/ID area.